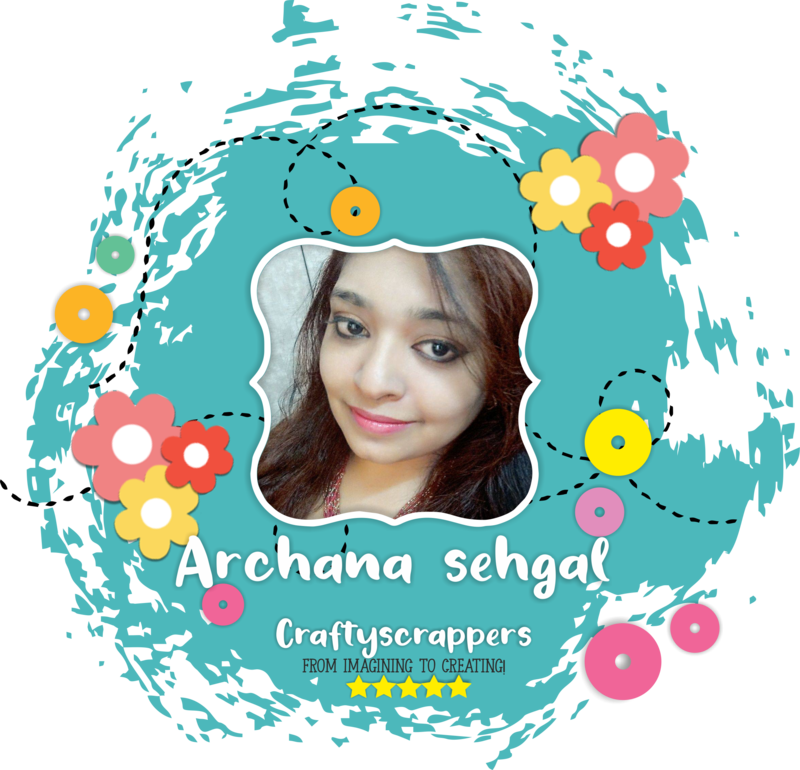 scrapbooks – Arts n Crafts supply store in India! 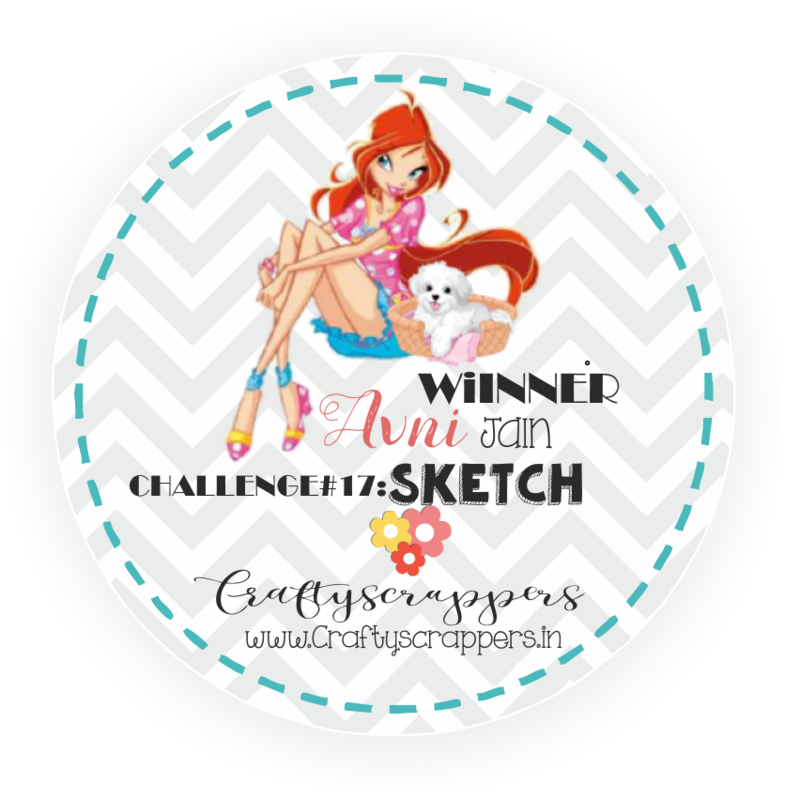 CHALLENGE#17:”SKETCH” & WINNERS ANNOUNCED For CHALLENGE#16. and for this month we have something exciting for you! Here is the sketch that you need to use to create your make for the submission. 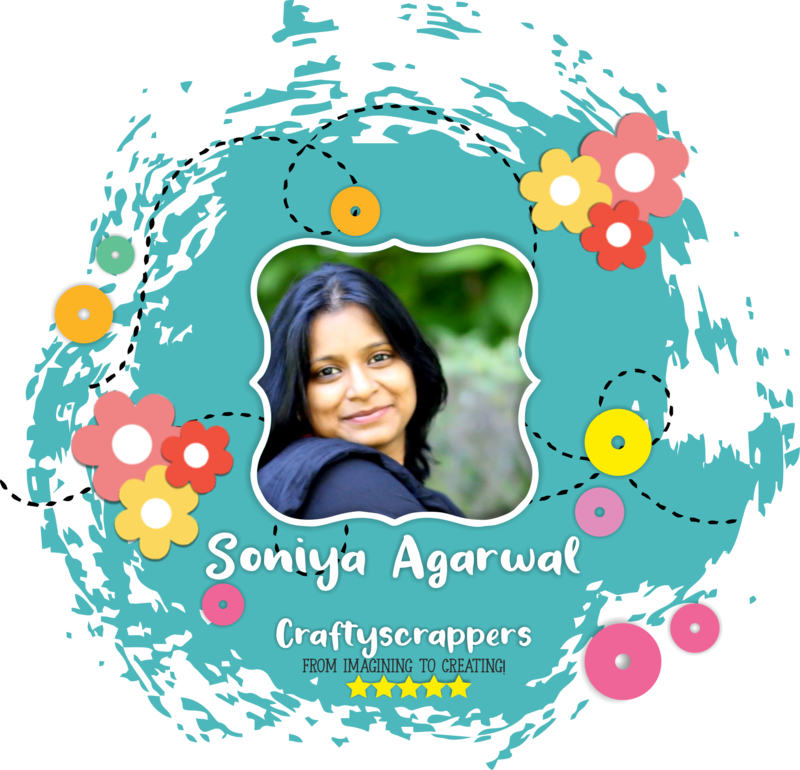 You can create any project using the provided sketch it can be a layout, a journal page, a simple card, interactive cards, mixed media canvas or project, altered art, anything crafty! You have the option to flip the image, rotate it, stretch it for larger coverage, but the design should be prominent. 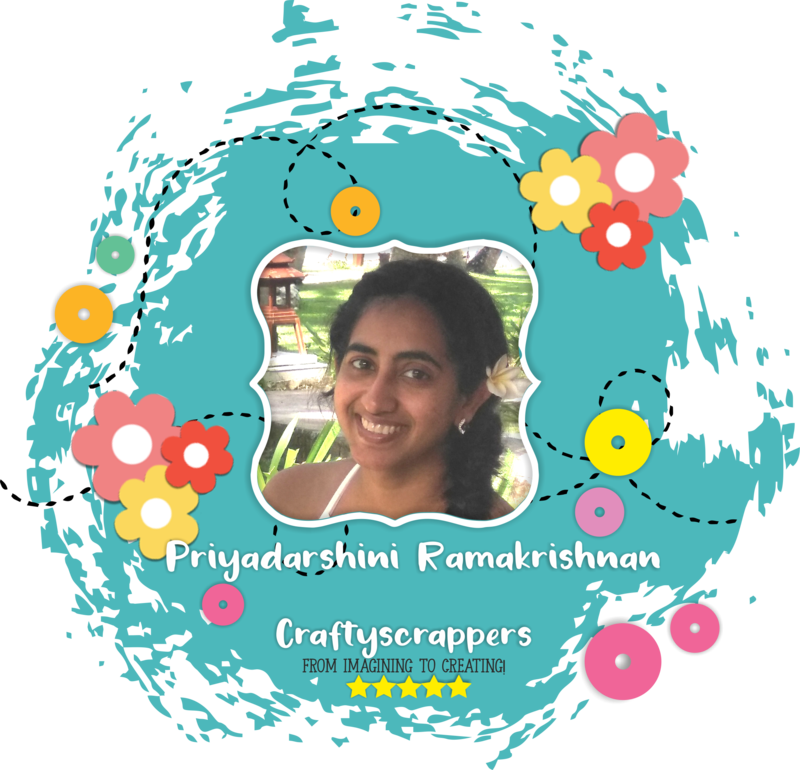 CRAFTYSCRAPPERS PRODUCT used should be the FOCUS of your project. If you do not have any products from us, You can purchase them from the store. Do tell us in your post what product you have used from our store. Link your projects with Mister Linky shown at the end of the post or through facebook at CRAFTYSCRAPPERS CRAFT CHALLENGES. To submit your creations for the challenge and to share them on social media, please use #Craftyscrappers challenge17 to qualify for submission,failing to do so, the entry would be disqualified. So do join in our November challenge to win amazing prizes. 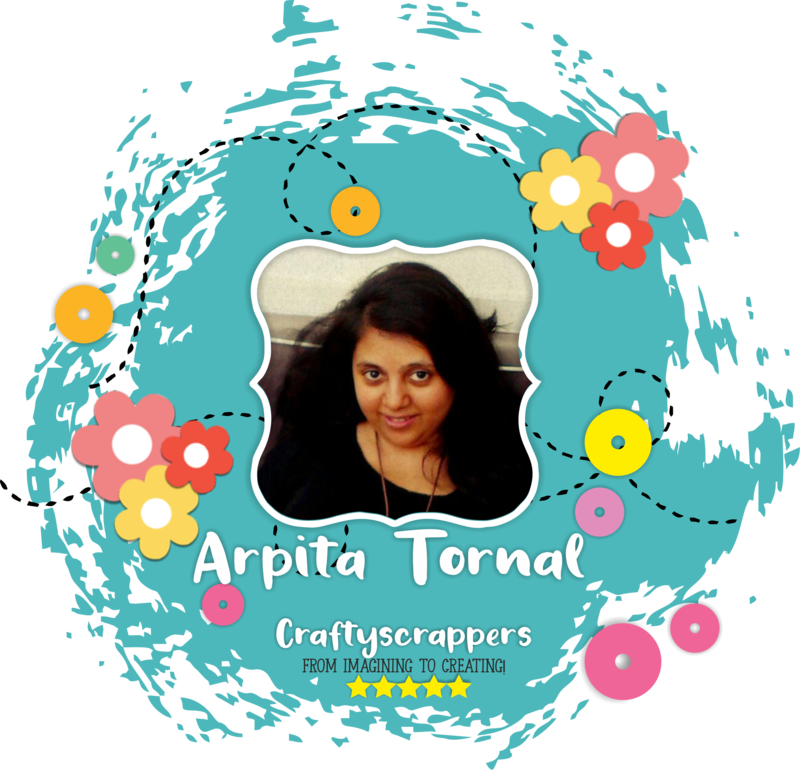 Craftyscrappers have amazing & huge collection of various craft supplies and that too at affordable prices! You can even customize the size of stamps and stencils! We had a nice number of cards and other crafty creations this month for our October challenge and several email, facebook and instagram entries. Despite the festivities going on… everyone had a little time to enter the challenge! 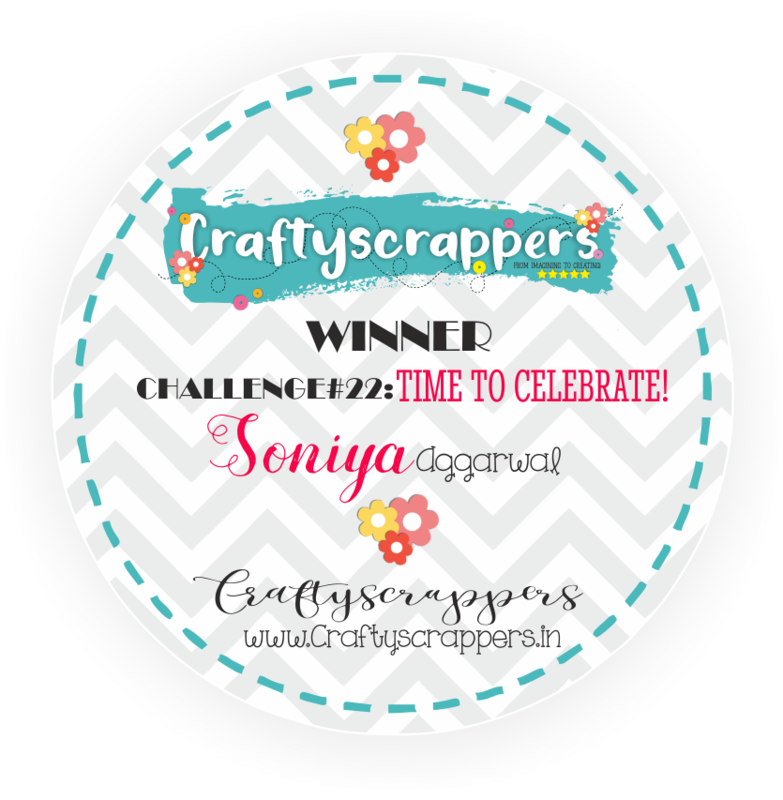 we had so many wonderful entries for this challenge… Lots of shimmery.. sparkly.. and dazzling creations were seen. Let me share the entries that made it to the Challenge. Aren’t these creations gorgeous… they indeed are!!!! We absolutely adored each and every entry by these talented people and we had a hard time deciding on the winner. There was a tie between Uma didwaniya and vinita jain, whose creation received a huge majority of votes and appreciation from everyone! She used our stamp set- Be Mine to create her make. 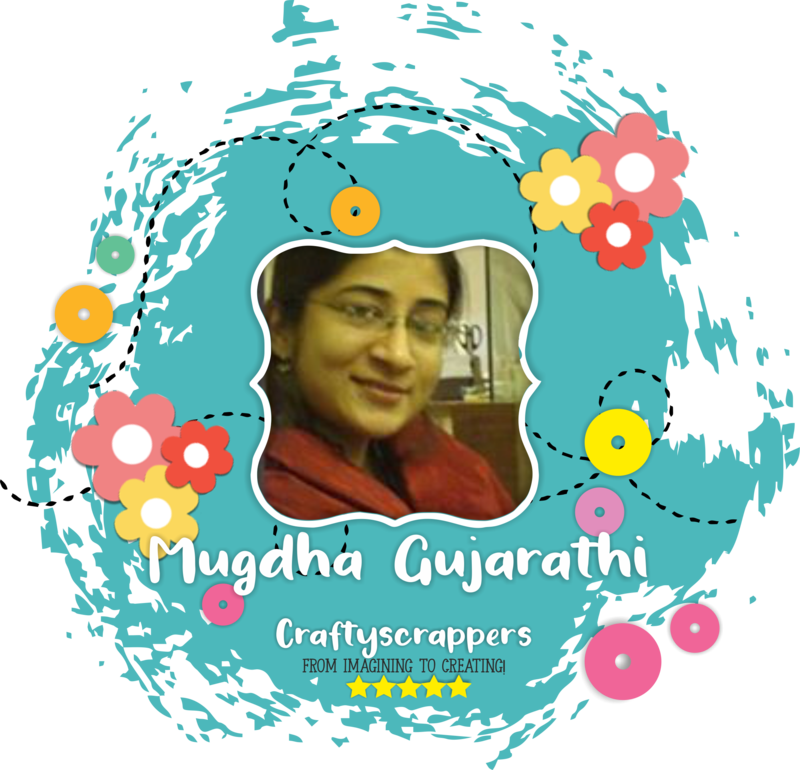 Do check out her blog, to see how she created it. And she will receive this “sparkly goodie bag” from us. ” hippo wishes to u.” for the challenge. our super talented DT members have created some fabulous projects. On how to create this Interactive card. Background is made using mini Brick stencil and Sizzling Silver Fun Foil. For the other half I have covered the card with pattern paper but after using a splash of Shimmer Spray, “Sweet Sunshine” & some pink acrylic colour splashes. Cute mermaids, sentiment & the background stamping is done using stamp set “Mermaid Wishes”. Coloured the images using pearl acrylic colours. Used Pieces of vellum to make base for mermaids. 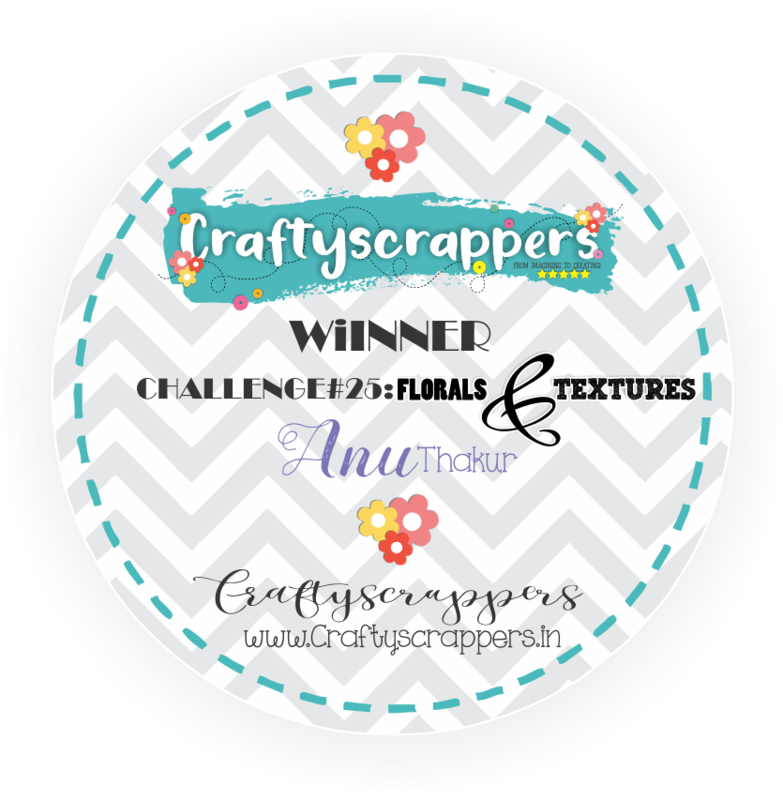 We used a lot of CraftyScrappers Products for this one and kept our layout simple. On how to create this Clean & Simple Layout. For our background, we used the Rose Bunch Stencil with Splash Stem Shimmer paste and then added some colour with Bitter Lemon Shimmer Spray. We used the Sliced Dots Stencil with Ocean Waves Shimmer Spray on a separate piece of white cardstock and die cut it for our layering. We stamped the Being Indian Stamp, coloured the image and fussy cut it. We stamped some flowers and leaves from the Sending Smiles set, coloured and fussy cut them. After arranging these elements we chose our title. It is an MDF piece combined with stamping from the ”Happy” Stamp set. We coloured our MDF title with the same shimmer paste and at a few places sprayed the shimmer spray to get a multi-tone effect. We adhered all the elements and used some rhinestones, to finish the page! For this project I have used lot of awesome supplies from Craftyscrappers. For this project,I took a simple silver card stock and applied some Ash shimmer paste and let it dry. Once its dried I run it through an embossing folder.Then I stuck this sheet to cardboard. For second layer I took a gift wrapping shimmery sheet and again embossed it with same folder,then stuck that on top of base with help of double sided tape. After that I stuck a window die cut from one of the pattern papers. Next I used Craftyscrappers “IM Stuck On U” stamp set to stamp and water color these beautiful succulents.I did fussy cutting to these stamps and again attached with double sided tape. The sentiment is a metal embellishment stuck on a background created using same ash shimmer paste and some blue and green metallic paints. Select a pattern paper of your choice. Take some generous quantity of texture paste and spray shimmer spray “Grape Juice” to it. Mix it well and apply this paste to the corner of the page using Feather Stencil from the store. Next take a MDF sentiment and apply a coat of gesso to it. Once dry spray it with shimmer sprays “sweet Pumpkin” and “Grape Juice”. Both the shades blended so well to give a beautiful shiny colour effect. Spray these shimmer sprays to few mulberry paper flowers as well. Arrange all the embellishments to the layout. 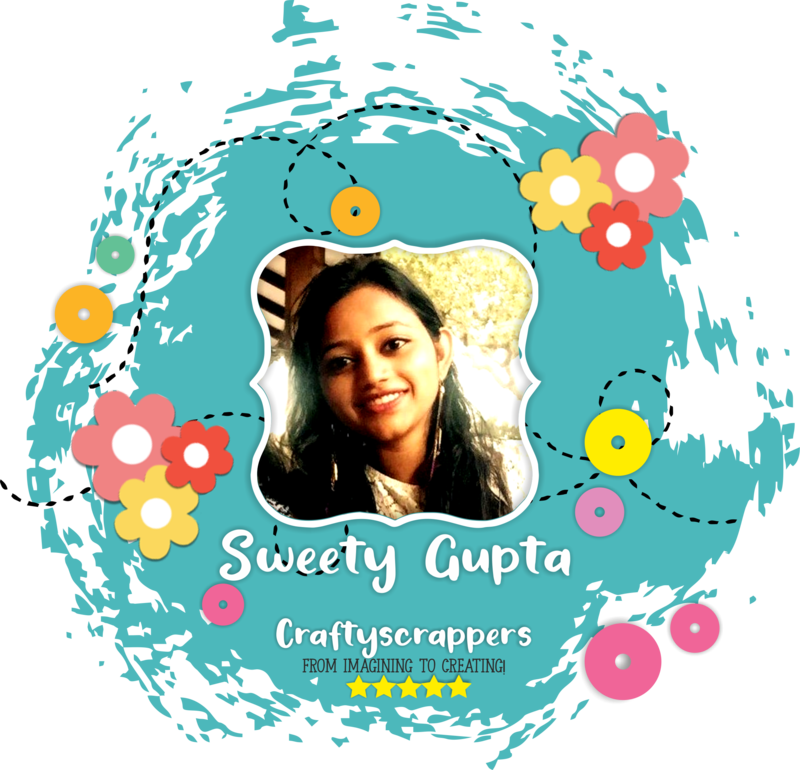 Hope you’re inspired and will come up with your projects with craftyscrappers products! Waiting to see your lovely projects! Have fun with our challenge for which the entries close on 3Oth November, 2017 and good luck! ONE SHEET MINI JOURNAL BOOK: a video tutorial! 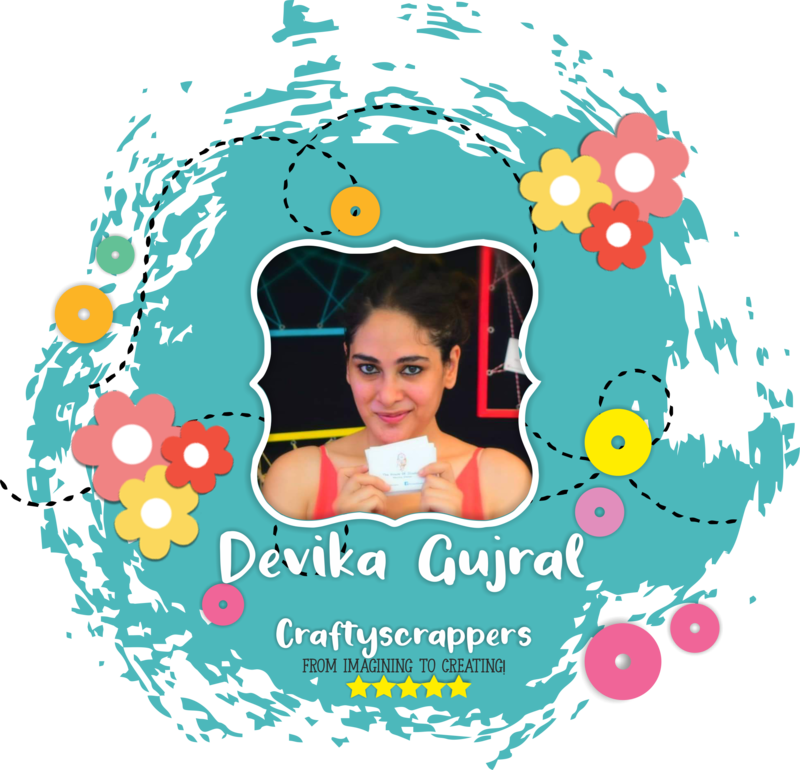 This is Priyanka on Craftyscrappers blog today and I am super excited to share a video tutorial on “One Sheet Mini Journal Book” , with the magic of shimmer sprays! Isn’t it amazing to make your own journal book that too in a quick way no binding….no messup to join the pages…….just with one sheet! And yes it has good enough pages to record your memories! Last date of submission is 31st Oct 2017. 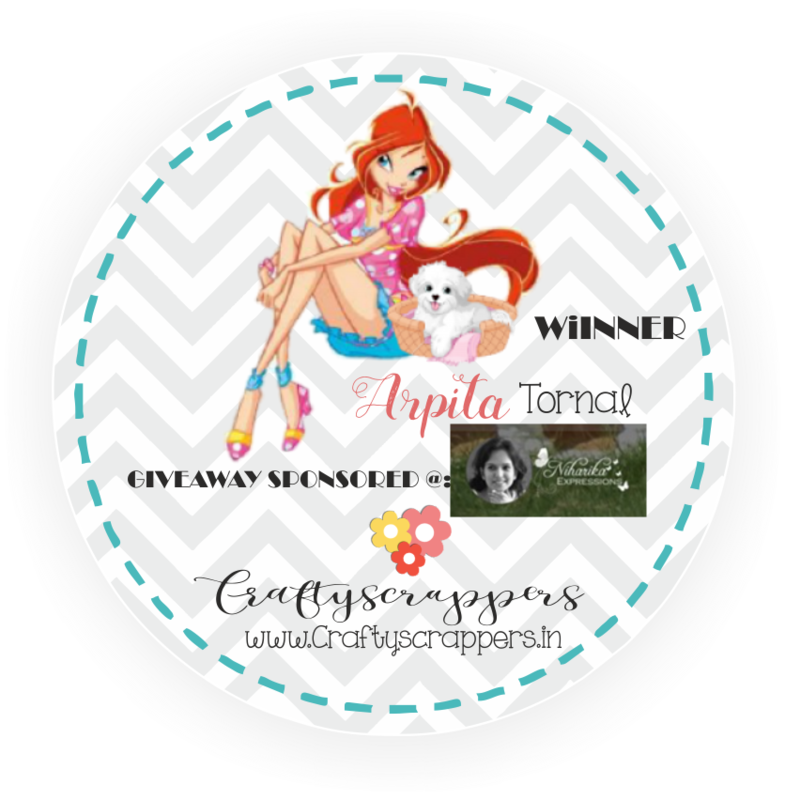 To win this Huge goodie bag from Craftyscrappers. Wishing you tons of fun- 5X5inches. Damask this! – 2×3 inches. Glitzy Gold – 1 pack. So thats all you’ll get in the win, isnt it great!!! You can participate in our challenge via email, facebook, and instagram too. Just add ( #craftyscrappers challenge16 ) and thats all! Craftyscrappers Stencils “French Script” . 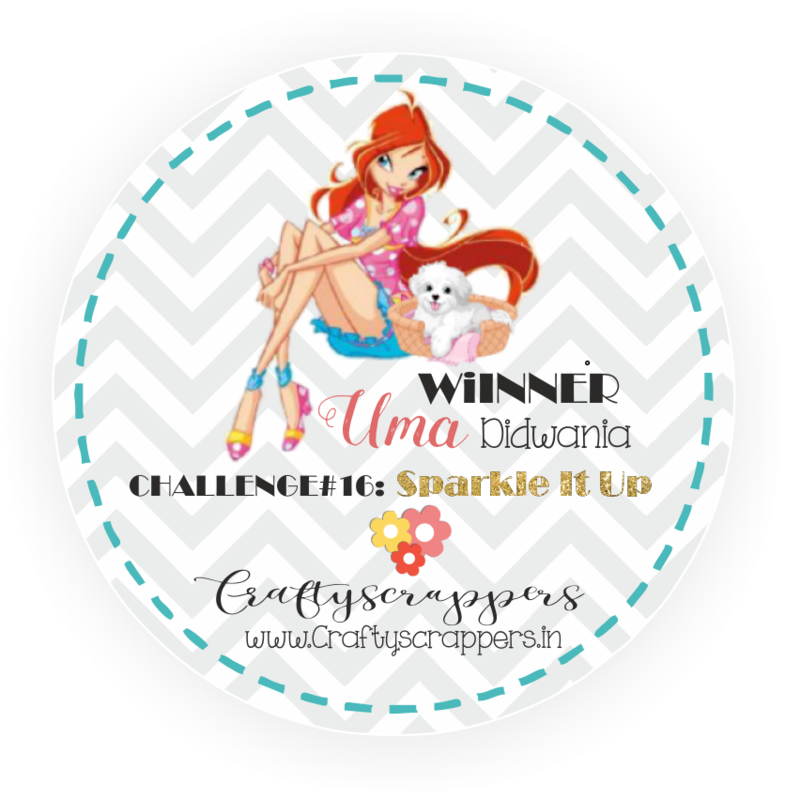 Craftyscrappers Stamp set “U Sparkle”. Paper flowers and a piece of lace. The focal point of my project are shimmer sprays. I have used shimmer mist technique here. Repeat till a bright shiny effect is achieved. It was great working with these shimmer sprays, shimmer pastes and stencils too! CREATIVE TREAT BAGS: a tutorial! 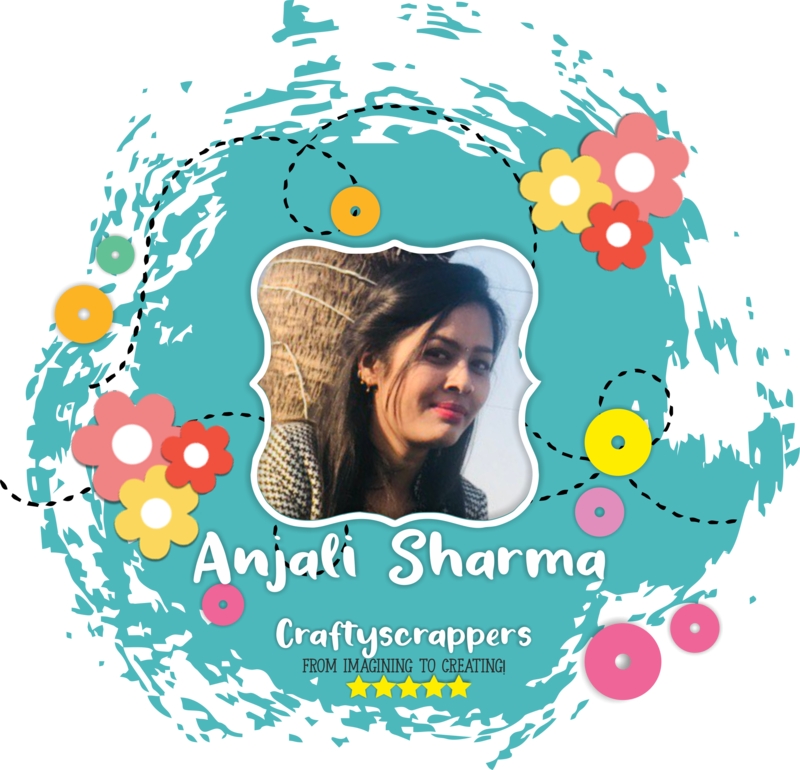 Anila here and iam back again at the blog with a tutorial. Our challenge for this month of October is ongoing. Coming back to today’s tutorial now…. We often give out gifts to kids for birthdays or even as birthday return gifts. 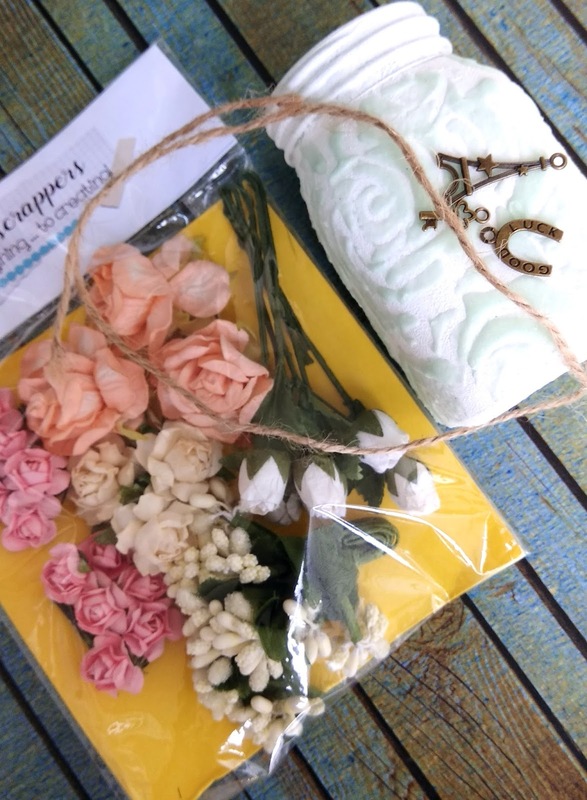 How about making environment-friendly treat bags to give these gifts. stamp sets – Hogs & Kisses and Peek-a-boo. Here’s a look at the completed treat bags! A step-by-step pictorial guiding you in making your own treat bags. I took an A4 size paper. Folded half-inch margin at one edge. Folded the remaining paper into half. and one and a half inch at the other end. Opened the sheet and cut the marked parts. On cutting/trimming the marked parts, you get a sheet with scored sides. I took Archival ink and my favorite stamp sets. I took two images from the stamp set and stamped the images randomly all over the sheet (rotating the image randomly) Let the ink dry before the next step. Here, I have used different colored papers to make the treat bags. 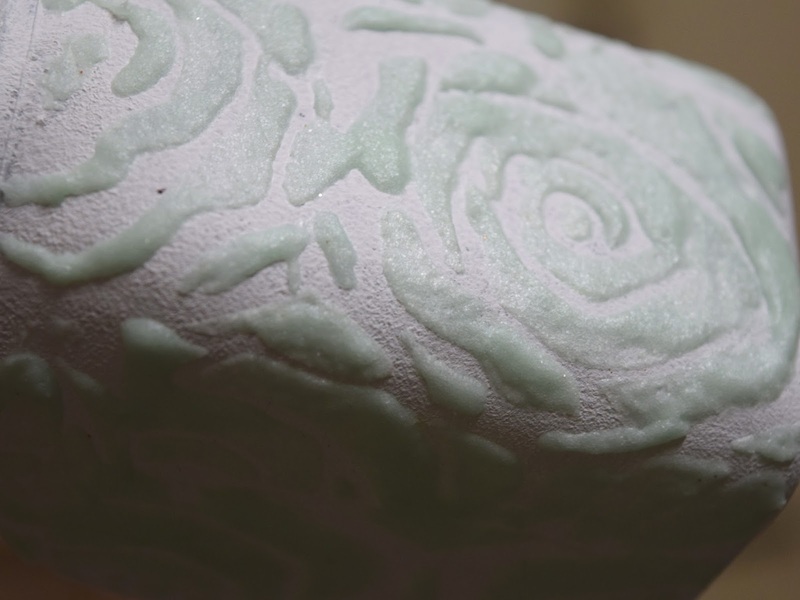 You can also use a white sheet and lightly color these stamped images. Once the ink dried, I adhered the adhesive tape to the two margins on the sheet. Peeled open the tape and assembled the treat bag by bringing in the sides together. The one and a half inch margin remain open as it is the lid/cover of the treat bag. Repeated the process with all the three bags. And the treat bags are ready…. To decorate the treat bags…. On a watercolor card-stock, I stamped the critters from the Hogs and Kisses stamp set, using Archival ink. Colored the critters with zig markers and fussy cut them. Cut tags from scrap pieces of CS. Assemble the tag using the fussy-cut critters and the sentiments. Now fill the treat bags, tie a ribbon/twine around it to close it. Tie the tag along with the ribbon/twine. Here are all the finished treat bags. Hope you enjoyed making these treat bags. BEAUTIFUL TAGS: a complete tutorial! using different techniques and mediums. Stampers have used tags for years to create mini works of art. A tag is small that is not too intimidating very easy and fun to create..
that is .. it’s okay, even if you mess up. Tags are great for experimenting with new techniques, too. of any size to create your own custom sized tags. Took the tag, secured it on the table with washi tape. Then Secure the stencil over the tag with washi tape. Take sufficient amount of shimmer paste (Separate stencil and shimmer paste for each tag) and evenly spread it across/through the stencil. Repeat the same for all the three tags. The shimmer pastes and shimmer sprays are extremely versatile and beautiful in itself. For the third tag, I coloured the background using distress ink. Let the tags dry again. Next, I started layering the tags with pollens and lots of flowers. I tried to use the matching colored flowers and pollens for each tag. and mounted them on the tag using foam adhesive. I tied twines along with coordinating ribbon through the punched hole. Lastly added matching sequins from craftyscrappers to add some elements. For this Tag, i have used the sentiment from the stamp set, “Doodly Blooms”. So that’s all for today! It was really exciting playing with the shimmer pastes and the shimmer sprays. Can you tell me which tag is your favorite? Do leave your feedback in the comments section. & tutorials by our team, so stay tuned! 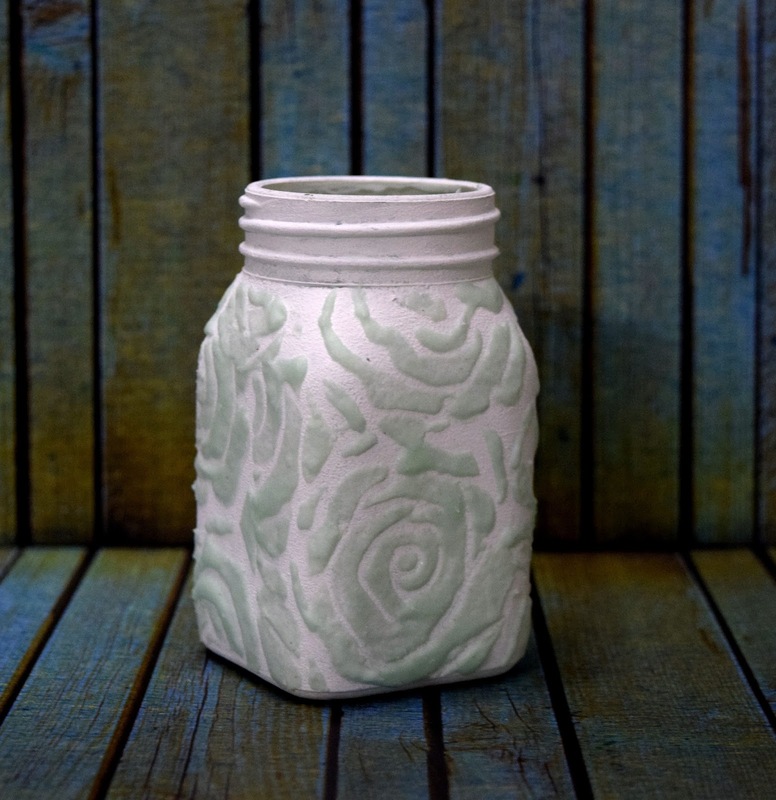 CREATIVE RECYCLED JARS: a step-by-step! I got a variety of goodies and some of them I have used in this project that i am going to share with you today. 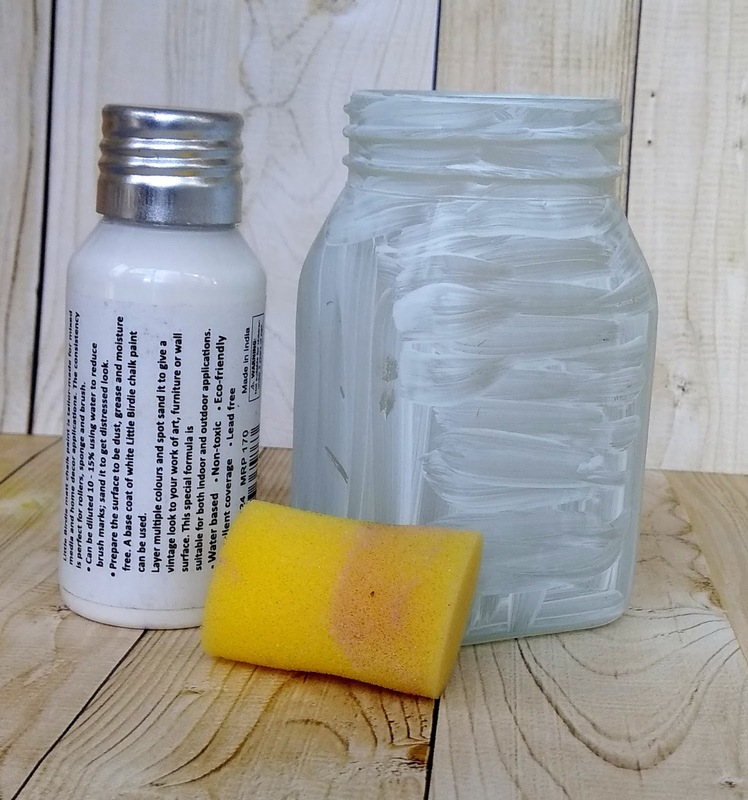 Then, continue reading this post and learn with my photo tutorial..
How to covert those plain glass Jars/bottles in to a perfect Home Decor.. 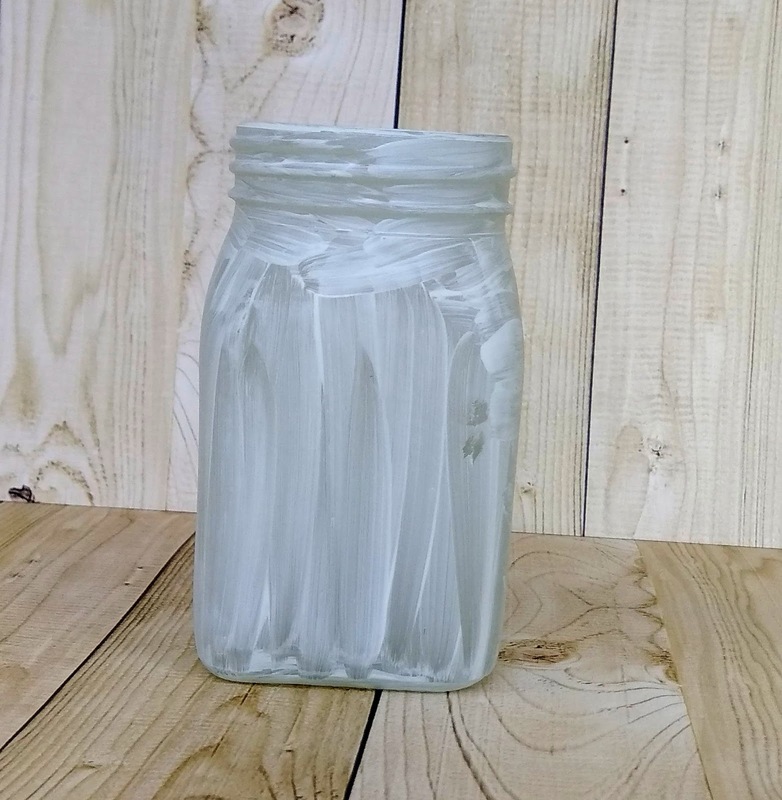 I took a empty glass Jar, cleaned it’s surface properly and applied a coat of gesso. A layer of gesso makes the surface ready for painting. 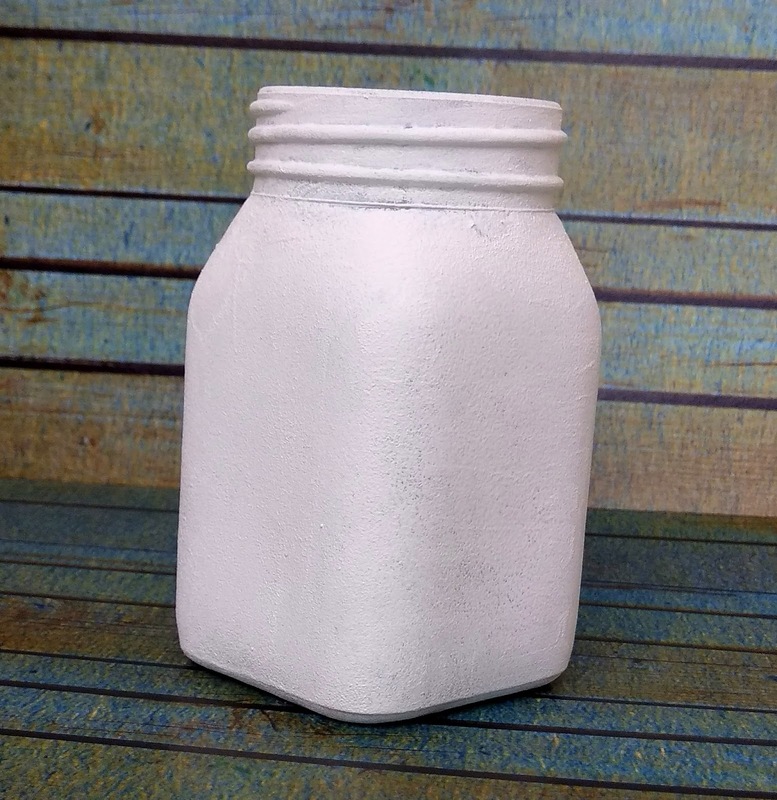 Once dried, I painted its surface with white chalk paint ( you can use acrylics too) using sponge and let it air dry. from Crafty Scrappers to decorate my jar. I really enjoyed whole process. .I hope you will get inspired and make your own master piece for your home sweet home.. I will be more than happy to help you with any query. Keep watching this space for lots of inspirations & tutorials.